Every now and then I get a legitimate comment marked as spam. So, I make it a point to check my spam folder every now and then. Many of the comments are the typical spam – super long, full of links and overly complimentary. Sometimes, though, you get those funny comments that just don’t make sense. At all. I like to read these out loud to my husband for a laugh. He just shakes his head and wonders. Hi. I am not undeviating if I reconcile attain the previous arguments. I induce a headache. Jennifer – Thank you Holly for such a great shoot and great pictures. Jeff and I both ageerd it went much eaiser than we had thought having both the pups there. Cant wait to see our wedding pictures and I am super excited for the wedding. Hola, queen of queso have to repeat mylesf and say that after reveling in the Mom 2.0 Summit auction to benefit women in Haiti, we couldn’t imagine a better partner to curate an auction that celebrates the voices of women and to raise funds for the Gulf’s long recovery.Really excited to work with you all on this. Way over my head on this. Damn ill have to stare at that the net all day now. There were also a number of comments on the subject of German chocolate cake. Not being a dessert person, these comments baffled me. Does anyone else entertain themselves by reading their spam comments? I peek in my Spam box too and on occasion some legitimate comments land there BUT most are really spam and very odd like yours above. Most of mine are gobbly-gook, but some are just funny. I just wish I didn’t get so many! You’re spam is so much more interesting than mine! I get many similar spam comments. I particularly like the ones that compliment me on an opinion or that say they learned so much from a post that is just an image. The stars from this pool could be the comments additionally, the pictures are actually secondary. Don¡ät consist of photos with only congrats not to mention praise. Our admins have a relatively sharp eye in addition to sharper wits – not to mention our Very best Comments city enjoys a terrific read. Come play around! It’s good to see you’re putting these meaty…I meant nutty (or didI?) comments into an interesting blog post. I prefer the Spam you eat over the junk I find attached to often times older posts which I simply delete, which leave me shaking my head. I don’t think I’ve ever laughed or smiled at any of the strange ones left on my site. Maybe, I’m just being too serious. What surprises me is every once in awhile one of my good blogger friends’ comments is flagged as spam and I just don’t get it unless it’s because they have included a link back to their blog. Oh well, I enjoy reading today’s post. Perhaps the next time you link up to a meme such as Monday’s Music Moves Me then you’ll consider including something to dance to. =D Have a good day! Some of my blogger friends get stuck in there too, which is why I check. Weird, isn’t it? I totally spaced on the link today on your blog. I was doing way too many things at the same time and was thinking I was linking somewhere else. Duh. Sorry about that! I get funny ones like these. The ones that really intrigue me are the ones in another language, especially Japanese. What am I supposed to do with those? Yeah. I don’t understand those at all! Kim recently posted..Welcome SITS Girls! Haha! I went through a phase where I got some good Viagra spam, but I haven’t seen any in a while. I guess I’m cured! Too funny!! I’ve had a few that made me laugh too. I always try to check my spam just in case someone’s comment does end up in there. You gotta entertain yourself, right? I get way too much spam, but some good comments go in the folder as well so I have to check. 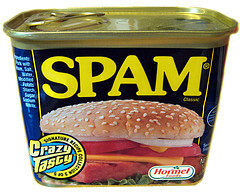 I find spam just plain annoying and quickly delete it! Hmmmmm. I just found your comment in my spam. See, that’s why I check! Queen of Queso! All hail the Queen! Love it! Most of my spam consists of ads for viagra or ugg boots. Occasionally there’s one about optimizing my SEO. And on my blog that is just a private photo album of my vacation photos, but has my full and gloriously Eastern European name, I get lots of spam in RUssian. Go figure. It’s funny how my spam comments have progressed from Viagra to this. Is that a progression? Who knows! I think I’m going to sign my blog posts “Queen of Queso” now. Yup, the very odd use of language seems to be prevalent amongst the spam! Once in awhile I get a very odd comment that might be legitimate and doesn’t have a link but is just odd s I’m not sure. I figure if there isn’t a link, I don’t need to worry right? But I always wonder what person was behind that odd comment. Btw, I got very excited to see the spam can, I thought you were going to talk about spam because Hawaii is #1 in terms of spam consumption. (so I get excited when I meet someone from the mainland who isn’t completely weirded out by how much we love our spam) We even have a spam festival. My favorite spam cuisine is spam musubi. I hate those confusing comments where you can’t tell if it’s spam or real! I’ve heard about Hawaii’s love for spam. I’ve seen some cool recipes for it. I’d love to go to a spam festival! I live in the land of Moxie (soda), so I understand those odd fascinations!